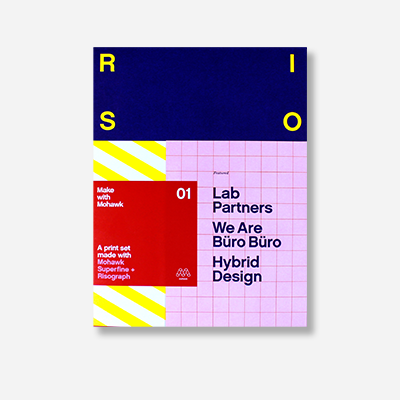 At a glance, Risograph and Superfine may seem like quite the odd couple. Originally invented to make use of low-cost inks, Risograph printing comes with inherent quirks: off-registration, limited colors, uneven ink performance—in short: an inaccurate and inconsistent process. But it’s also…absolutely delightful. Much like the Holga camera with its brilliant simplicity, lack of precision and light leaks, Risograph’s bugs are its defining features. In a world of technical perfection, it’s a process rich in happy accidents. Superfine, on the other hand, is all about precision: Beautifully formed, always consistent and subtly tactile—it’s the paper that’s predictably perfect. Arguably the best canvas to print just-aboutanything, there’s no question what will happen when you print on Superfine—it’s going to be beautiful. So, what business does Superfine have hanging around with Risograph? Superfine shines when showcasing design intent, whatever that intent may be. Superfine is like a crisp, neutral gallery wall: It shows respect to the work, by amplifying intention and making absolutely clear that what you see is a statement, not an accident. Imperfection printed on the most perfect paper makes those happy accidents not so accidental. In this way, Risograph’s quirks are celebrated, not as limitations, but as design elements; an extension of the will of the designer. What’s exciting is that these unique qualities make process part of design. Need a bit of inspiration to help you get started? Snag a copy of this print set made with Mohawk Superfine + Risograph to see the possibilities.